The eighth edition of 1-54 FORUM convened around the title, The Conversationists, with an aim to interrogate the role that educational programmes play in producing and sustaining an economy of knowledge. Contributions were made from individuals working across visual and performing arts, education, writing and publishing, including: Hans Ulrich Obrist (Artistic Director, Serpentine Galleries), Sepake Angiama (Head of Education, documenta 14), Emmanuel Iduma (co-curator, Nigerian Pavilion, Venice Biennale 2017) and artists Pascale Marthine Tayou, Emeka Ogboh and Michael Armitage among others. FORUM takes the form of a series of inter-generational and cross-disciplinary conversations, attending to a range of strategies and perspectives. It examined how public programming is performed and actioned across a range of cultural platforms and formats. FORUM has identified two guiding questions with the aim of pushing beyond their potential limitations: How to continue to engage with Africa and the African diaspora as a topography or sensibility within the context of an international narrative, and: Who are the agents of critique, and how are shifts in knowledge and cultural production shaping critical discursive practices? The fair’s talks programme is curated by Koyo Kouoh (Founding artistic director of Raw Material Company, Dakar). The FORUM programme took place over 3 days (6 – 8 October) at Somerset House during the fair (5 – 8 October 2017). Listen here all our past FORUM talks and find below individual audio links. What is ‘the after’ and what occurs in this implicit posterior phase? The opening panel addresses the reverberations of the so-called ‘African art boom’ in an effort to examine how to continue to engage with Africa as a subject, terrain or sensibility within the context of an international narrative, and in a manner that prioritises the development of Africa and diaspora-centred discourse. With speakers Elvira Dyangani Ose (Lecturer in the Department of Visual Cultures, Goldsmiths and Senior Curator at Creative Time) and Sepake Angiama (Head of Education at documenta 14) and Melanie Keen (Director of Iniva), moderated by George Shire (cultural theorist and historian of ideas). Nick Hackworth (Creative Director at Modern Forms) in conversation with artist Emeka Ogboh on aurality and sound as a vehicle for narrating and assembling sonic forms of resistance. How and where do practitioners situate their practice, and how through one’s practice, are spaces for critical exchange developed? From artist-led platforms to projects developed from within and in critique of institutional formats, this panel aims to engage with the dialogic as an artistic and educational practice. With Michael Armitage (artist and co-founder of The Gathering, Nairobi) and Mukami Kuria (writer and co-founder of The Gathering, Nairobi), moderated by Koyo Kouoh. What is the future role of programming? Which publics will be served, and how will these actions permeate and respond, beyond discursive reiterations, to the conditions of a wider community that the institution is a part of? This panel aims to unpack the role of discourse, what it can potentially achieve and its shortcomings as a productive or non-productive entity. With András Szántó (author and cultural consultant), Adenrele Sonariwo  (lead curator of the Nigerian Pavilion, Venice Biennale 2017) and Tumelo Mosaka (Curator of Cape Town Art Fair 2017), moderated by Koyo Kouoh. How do artists navigate the position of invited critic and self-directed agent of resistance, and where are the lines of agency drawn? This panel aims to examine whether and how practitioners are challenging and disrupting the notion of the ‘essential critic’ through collaborations, interventions/take overs, alternative modes of production and resistance aesthetics. 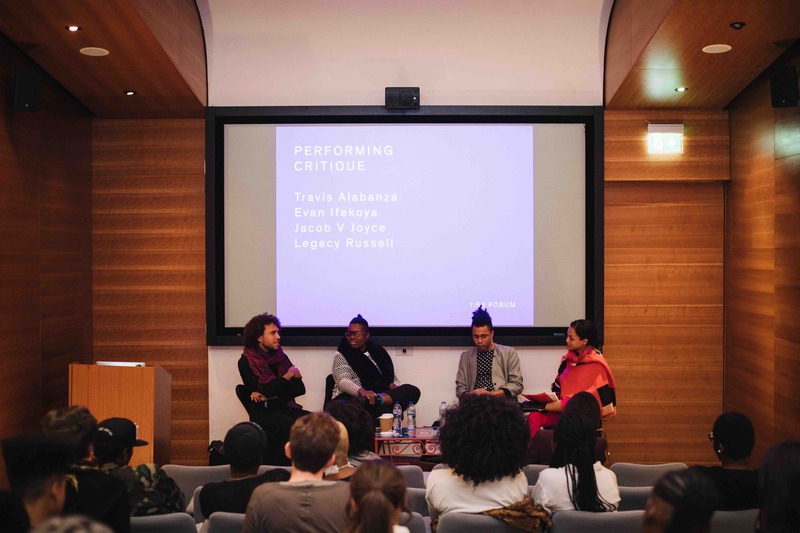 With Travis Alabanza (performance artist, writer and theatre maker), Evan Ifekoya (artist) and Jacob V Joyce (artist), moderated by Legacy Russell (writer, artist and cultural producer). How are independent practitioners performing critique within and on the margins of cultural centres through forms of ‘writing’? And what are the alternative narratives that are being prioritised? In this discussion, the panel engages with the expression of critique through the written and spoken word. With Sofia Niazi (Editor of OOMK Zine), Belinda Zhawi (writer, educator and 2016/17 Institute of Contemporary Arts Associate Poet) and Etienne Joseph (researcher, archivist and educator), moderated by Hansi Momodu-Gordon (curator, writer and producer). Hans Ulrich Obrist (Artistic Director of Serpentine Galleries) in conversation with Emmanuel Iduma  (author, editor and associate curator of the Nigerian Pavilion, Venice Biennale 2017) on reactivating historical material through writing and conversation as a critical, poetic or speculative enquiry. Koyo Kouoh in conversation with Senzeni Marasela (artist) on building conversation through durational performance and parafiction.